Mostly lazy day. Went to a burger place in Camden for lunch, then I popped down to St. James's to do a spot of clothes shopping. Later on in the afternoon I went to Homebase and bought an outdoor cupboard for the garden to help with some of our storage issues. Another pub lunch at the Pineapple, this time with Chie. In the evening, wine. Chie came back from Japan this evening. The flashy stick Erika got at the circus yesterday had broken on the way home, and Erika was quite upset. Luckily I managed to fix it. 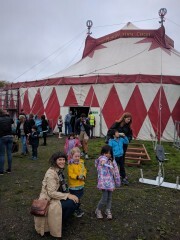 Took Erika to see the Moscow State Circus. Took Erika to the zoo for a short while in the daytime. As is often the case, despite Erika asking to go to the zoo I questioned whether or not she actually had much interest in seeing any animals - we did a reasonably thorough tour of the reptile house and the aquarium today, but that was it in terms of zoological observation. Also went to the playground for a bit (both the one inside the zoo and later on the one outside), Erika had her face painted, and we had lunch there. I managed to strike a deal of sorts to ward her off the usual temptations of candy floss etc and instead let her buy a small soft toy in the shop on the way out. Did a bit of shopping in Camden on the way back home, then I spent most of the rest of the afternoon tidying up the flat and cooking, while Erika graciously entertained herself. I was starting to feel a bit starved of grown-up company after a week of not being able to go out (with Chie being away) so I'd invited some local friends round for an impromptu dinner party. Well actually technically I'd just invited them round for some Champagne but as the only time they were free was around dinner some basic solid sustenance had also to be proffered. I had a whim of trying to recreate John Betjeman's salons, where he'd have other creative types round to drink Champagne from pewter tankards. However I don't own any pewter tankards. Plus of course, given that we collectively also had two small children to wrangle (Erika and their daughter) the conversation couldn't really operate on anything like a Betjeman sort of level, but I was glad of the company regardless. Seemed to feel a fair bit better today, obviously the worst of my cold was behind me. I asked Erika whether she wanted to go to the after school club again today, or whether she'd just like to spend some more time with me instead - as I'd put in a few hours later on in the evening this week I felt quite entitled to down tools at 3:30 today (and in fact again ended up working more after Erika went to sleep). Erika chose the latter, which was nice. So after picking up Erika from school we went for a quick drink at the Pineapple, then down to Kentish Town High Street to do a bit of shopping. Erika said she wanted to go into Iceland - I'm not sure I've ever actually been into one before. It's like a different world. We bought some ice lollies there and not much else. We also went into Holland and Barrett, and then headed home. Made macaroni cheese for dinner, which had a much more favourable reception than the previous evening's paella. We had ran out of playdates for the week by this point. Erika's school has an after school club for kids with working parents, and Erika was keen to try this out, so that helped to fill a gap today, and I was able to work until about 5:30. In the evening my cold seemed to reach its peak. Or perhaps that should be nadir. I felt pretty awful - feverish, a sore throat, and generally run down and lacking any energy. I think this may have been the day I struggled most during the time Chie was away - unfortunately children at age 5 don't really have much in the way of empathy, and so my hope that Erika might see I was clearly feeling quite unwell and give me an easy time of it accordingly was apparently naive. I made some vague approximation of Spanish food for dinner - paella etc - and Erika really didn't seem to like it, it was a struggle getting her to eat anything other than the padron peppers, which I doubt provide a lot of nutrition. Giving Erika a bath was then similarly a struggle, as was getting her to sleep. Another similar day to the previous two - I worked from home while Erika was at school, then after school another playdate. This time Erika had dinner (referred to as "tea" which amongst the local parents seems to mean an early dinner specifically for kids, not the general synonym for dinner as it is used up North) with her friend, which was a kids only affair, so I ordered some Indian takeaway for myself for later on when we were back home. I seemed to have picked up a cold, and was starting to feel a tad under the weather by today. As a result I was struggling to keep up the routine of getting Erika to sleep then doing a couple more hours of work - I think tonight I may have just fallen asleep when Erika did. Similar plan to yesterday, I dropped Erika off at school in the morning, then worked from home while Erika was at school. Then I picked her up at 3:30, and delivered her to another playdate which Chie had thoughtfully pre-arranged before her departure. This time though when it came time to pick Erika up from her playdate, she decided she would like to have dinner with her friend, and the family also very kindly invited me to join. So I had gin and tonics with Joe in his kitchen while he cooked dinner for all of us, and the girls played a bit longer. I was really quite touched this week by how kind everyone was in helping to look after Erika when they heard Chie needed to go back to Japan for a while. Once back at home I assembled the frame for Chie's woodblock print I'd picked up at the Japanese Gallery in Kensington in July, and I think Erika and I did a bit more drawing together. Then after Erika went to sleep a bit more work again. First day of my extended period of working from home while Chie was in Japan. I'd decided it didn't make sense to travel to the office between dropping Erika off at school at 9 and picking her up again at 3:30, particularly as recently I'd found I could be just as productive at home anyway. Although Erika had a bit of a temperature last night, she seemed mostly fine today. I asked the staff to keep an eye on her, and although Erika did apparently at one point tell them she wanted them to call me, they checked her temperature and said she was fine. I received a case of GevCham in the daytime. This was the case of Louis Boillot 2014 I'd bought en primeur from Berry Bros and Rudd some time last year. I was slightly perplexed when earlier this year they'd charged me a cellaring fee - which seemed reasonable enough, but then when I'd requested they deliver after that I'd got a message saying it wasn't in stock. One of Erika's friend's Mum's had kindly offered to have Erika over after school for a bit, knowing Chie was away, so I took Erika round there and was able to get another couple of hours work done. Before I went to pick her up from her playdate I ordered some Chinese food to be delivered, and it was there waiting for us when we got back. Erika really likes duck pancakes (which we get with mock in fact) and I thought it might be nice for her to have something comforting and familiar like this to keep her spirits up while Chie was away. After dinner we made menus for a pretend cafe - I think inspired by a game she had been playing at her friends house earlier. After Erika went to sleep I did a bit more work - a common pattern this week, and I felt rather pleased with myself that I'd done a good job, not just at work work, but also at parenting - and it seems it's possible to achieve both of these by just entirely abandoning any thought of having my own free time! Kyle, Hannah and Ralph had moved to Harpenden earlier this year, which isn't far from Whipsnade Zoo, and Kyle had suggested we all go there together today. I was very glad of any suggestions for helping to keep Erika entertained while Chie was away, so gladly accepted. Erika and I got the train up to Harpenden in the morning (very convenient from Kentish Town, there's a direct train), met Kyle, Hannah and Ralph there, and then got a lift with them from there to Whipsnade. Not long after arrival at Whipsnade we had a picnic lunch, looking out over the surprisingly impressive views that are to be had from there - I'd always imagined that part of the country (Bedfordshire etc) to be very flat, but the zoo is actually on a bit of a hill with the flat bits all laid out below it. It was quite a treat to be able to have picnics two days running in the second half of September and the weather was particularly nice today for the time of year. We then went for a somewhat random child led tour of the zoo, with Erika and Ralph forging on ahead on their scooter and balance bike respectively. Kyle commented that it was interested to observe the differing attitudes to risk the two of them had - when the path came to a downhill section, Ralph would zoom fearlessly down with his feet practically up on the handlebars, and Erika would be constantly slowing herself with one foot on the ground. Inevitably we got to the playground which consumed quite a large chunk of the afternoon and I overheard many other parents questioning why they bother to come to the zoo at all when all their kids seem to want to do is play there. I personally was happy with Erika doing whatever she wanted as long as she was having fun, and being ZSL members we hadn't paid to get in anyway. By about 3pm both kids were starting to flag a bit, Erika hadn't had a great night's sleep either of the past two nights, what with all the disruption to her usual routines etc, and I could see she was starting to get tired and a bit grumpy. So we started to head back. There had been talk of chocolate cookies earlier, which Hannah had baked for the kids to eat at the zoo, then forgot to bring, and Erika was quite insistent that we go back to their house first to pick hers up before getting the train back to London. Back at home, the evening was a little bit of a struggle. Erika seemed to be coming down with a cold, and was starting to develop a bit of a temperature, which combined with the fact she was quite tired meant dinner time turned into a bit of an ordeal. There were three separate teary outbursts - a very long sustained one when she managed to accidentally bite her cheek, plus she also dropped a bit of hot food on her arm, and somehow scratched her leg. I was feeling the strain a bit by this point - and was only two days in to my 11 day stint of temporarily being a single parent! Chie's Dad had gone into hospital a few days ago and Chie wanted to go there to see him, so she flew to Japan this morning. I would be taking care of Erika by myself for the next 11 nights while Chie was away. Thinking Erika might be a bit sad at the prospect of her Mum going away for a bit, I decided it would be good to visit family today. Erika always loves going to see her cousins, and I thought for a change it might be nice to meet up with them somewhere for a day out in the great outdoors, rather than the usual plan of going to visit them at their house. So Erika and I got a reasonably early train down to Box Hill and Westhumble (we were up early anyway as Chie had to wake at practically dawn to get to the airport in time). As Adrian et al had things on in the morning today, we'd planned to meet them at the top of Box Hill (where there's a National Trust cafe and car park), so Erika and I did the walk up the hill by ourselves. She did seem a tad apprehensive about the whole thing to start with - presumably she was already feeling a bit out of sorts what with Chie's departure, and then on top of that my slightly unusual proposal to get the train to the middle of nowhere then walk up a big hill... but she was spurred on by the prospect of seeing her cousins at the top (and asked about every 5 minutes "Are they there yet? Who's going to get there first, us or them?"). I think she also enjoyed the famous stepping stones, even though owing to a slight miscalculation on my part we actually arrived at them having already crossed the river at a nearby bridge, so we ended up going over them once and then immediately back across again just for the sake of it. I was impressed by how well Erika did going up the hill - she only asked to be carried for one relatively short section. It is pretty steep in places, and must have been quite hard work on her little legs. When we got to the top, I thought the views were rather impressive, but it's hard to gauge what sort of an impact things like this have on a 5 year old - she seemed more interested in the conkers we had picked up at the bottom of the hill. Shortly afterwards we found Adrian, Liz and the kids, and Erika seemed to breathe a sigh of relief (My crazy Daddy hasn't just made we walk all the way up that hill for no reason). We had lunch on one of the picnic benches with a mixture of sandwiches we'd brought with us and a couple of extra things from the cafe - Erika had a sausage roll (or at least some of it) and I had a vegetable pasty. All 8 of us just about managed to fit on a single picnic bench and it was rather nice. After that we went for a walk around Box Hill's "natural play trail" - which I think was really nicely done - the walk was punctuated every few hundred metres with things like see-saws and climbing frames, all made from the local trees. It was really delightful to see all of the kids actually seeming to genuinely enjoy themselves outdoors, running through the woods and climbing trees. I wish Grandad Nick had been with us, it would have "gladdened his heart" as he would say. We were having such a nice time I realised I hadn't really been keeping track of the time, and Erika and I were supposed to be back in Kentish Town for a friend's birthday party in the early evening. We'd originally planned to get a train back around 3:30, which was starting to look increasingly impossible. I discussed this with Erika and she initially was very insistent that we should get to her friend's birthday party on time. However when I reframed the question pointing out that if she didn't mind being a bit late to her friend's party we could have an ice cream with her cousins before we left, it seemed to rather change things. So we decided to get the train an hour later, the kids all had an ice cream, then we said our goodbyes and Erika and I bounded back down Box Hill to the station. On arrival at Victoria we dashed across London to try and not be too late for the party - and in doing so very stupidly rushed onto a tube train as the doors were closing. No injury was incurred, but Erika did get clipped by the door on the way in, and more for the shock of it than the fact it actually hurt at all was quite upset. I was then very cross with myself for doing this with Erika, which was really stupid just for the sake of trying not to be late to a party. I thoroughly deserved all the judgemental stares I received from the other passengers in the carriage, and made a resolution never to do that again. As it happens we weren't the last people to arrive anyway, which I could easily have predicted, as one family among our local friends are always late to everything! Even though it was an early dinner (at 5:30) I'm not sure it really worked for a group of 4 or 5 year olds, it didn't seem long before they were getting over excited then over tired and there were a few near misses with waiters carrying plates of food nearly tripped over by seemingly unfettered children. Although the Wahaca in Kentish Town is very kid friendly, and usually half empty at lunchtime, on a Saturday evening it seems to be packed, and I got the impression everyone else was relieved when our table left. Anyway, slightly wild and unhinged though the latter part of the day was, I was glad of having been able to provide Erika with a very full itinerary for the day, which hopefully helped to take her mind off the fact her Mum was going away for a bit. I had taken Erika out for bike riding practice a few times since we got her bike earlier this year, and it had occurred to me even though I obviously know how to ride a bike myself, I had no idea how to teach someone else. When I'd ordered her bike, I also stabilisers to come with it, which in the modern era is apparently not considered to be the done thing. I have to slightly beg to differ here having learned to ride a bike in a period of history when stabilisers were the norm, and I don't exactly come from a generation of people who are incapable of cycling, so I have the impression it does all work out in the end. There was a certain joy both for Erika and for me on the day she got her new bike that she was able to ride it straight away without any struggle, and I can't help but wonder if she might not have such a positive reaction to it had it just caused her frustration from the outset. However, being the highly impressionable types that we are, Chie and I both soaked up all the dogma and after a few initial outings with the stabilisers on we removed them again. We'd then gone through a brief period of removing the pedals too, so Erika could treat it as a sort of balance bike (again, a modern notion of learning to ride a bike which is slightly lost on me). Finally, the last piece of advice we'd taken on board was to hold onto her rather than the bike, as somehow that makes it easier for her to learn to balance. Along with a lack of intuition on how to teach someone else how to ride a bike, I also had no sense of how long it would take. So when we went out today I was quite prepared for the fact Erika would pedal a bit while I was holding onto her shoulders, and had no particular expectation we'd get much beyond that stage. We did a few runs exactly like that. At times I would very briefly let go of her shoulders, keeping my hands nearby to catch her, and she'd wobble quite a lot - I didn't really have the sense she was close to balancing by herself. The pedestrianised bit of road where we were practising gets a lot of foot traffic from locals, and we saw several of Erika's friends and their families passing by while we were there today. When Erika's best friend at school and her family passed by, I briefly paused the cycling lesson to say hello. While I was just momentarily distracted, Erika decided to launch herself off on her bike all by herself. As if by magic, she suddenly got it and in an instant was able to cycle and balance without any help from me. It was quite an amazing moment to watch. After that, we went for lunch at Wahaca with Andrew and his two kids, and then went to their house for some of the afternoon so Erika and Zia could play together. In the evening I made a roast meal which I thought came out relatively well. I have long since resigned myself to the fact that my roast potatoes aren't ever going to be quite what I want them to be - I have tried just about every variant on the recipe out there, and suspect the fault lies somehow with my oven... but these were about as good as they ever get.